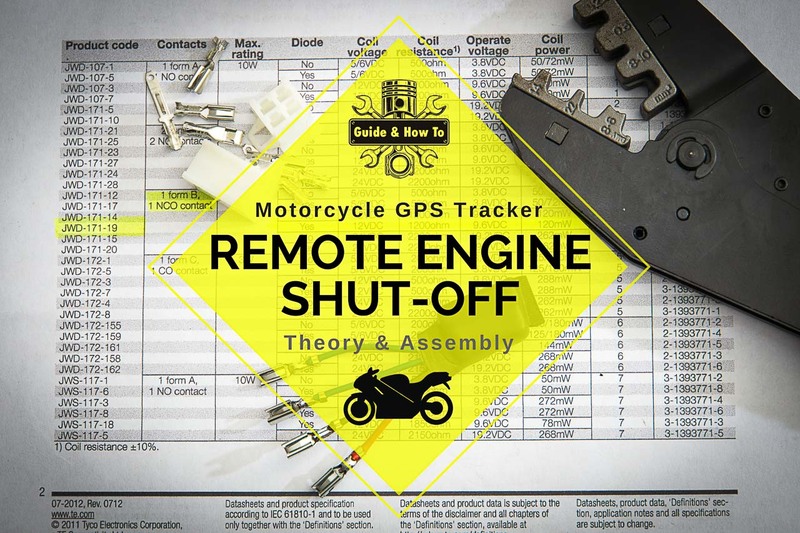 This how-to is actually just one component of my comprehensive guide on how to install a GPS tracker alarm with a remote engine shut-off device and dummy alarm on a Kawasaki Ninja 300. Wow, that was a mouth-full. Anyway, if you want to see the whole upgrade in order – which I recommend – here are the links. It’s a really comprehensive and interesting project, so you’re bound to learn something new. God knows I did while putting it all together. Remote Engine Disconnect Guide ⇐ That’s the page you’re on right now. You don’t have to read them in any particular order if you just want to learn. Or if you’re only interested in one single topic. But if you’re in the process of installing a motorcycle alarm – especially if it’s a GPS tracker alarm – you’ll probably benefit from taking a look at them all before getting your hands dirty. Even if you own a completely different motorcycle of whatever other brand, all of this probably still applies. Given that the remote turn off device doesn’t come with the bike, it’s gotta be universal. Basically, you can rest assured this guide applies as long as your engine turns off whenever you put the kickstand down with the bike in gear. There are probably minor differences, but most of them are either irrelevant or blatant. And in case of doubt, pull out the good ol’ multimeter. If you’re trying to add a remote turn off to a car, van or truck, then you’ll probably have to improvise using some other trigger. Perhaps rigging the fuel pump. But seeing the theory below will better help you understand what’s happening nonetheless. 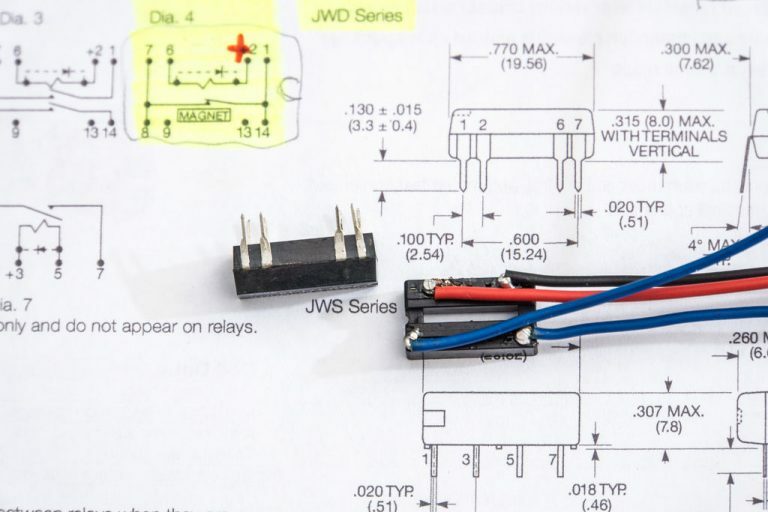 I found this JWD-171-19 Reed Relay suitable for the remote kill switch. 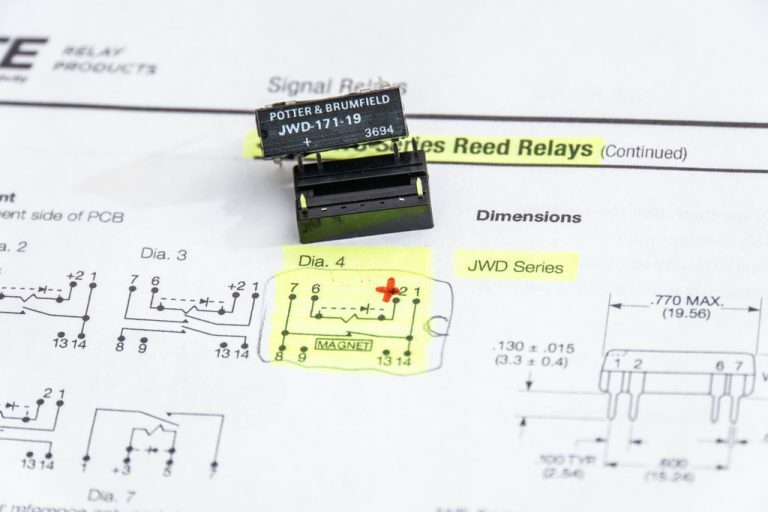 Any similarly specced reed relay would also work. A “Remote Engine Shut-Off” is a common feature on all but the most basic vehicle alarms this days. However, they are not all created equal, and many work in very different ways. The ideal implementation of this is, in my opinion, a latching relay. That is, a relay – read “high” current capacity, when compared to transistors – which only requires current to switch its position. It doesn’t require current flow to maintain the relay in that position. The benefit of that is that even if the alarm isn’t receiving power, the engine is still disconnected. Also, it doesn’t drain the vehicle’s battery to have the relay “activated”. I suspect something like that is what is used in the SPY 5000m 2 Way LCD Motorcycle Alarm System. I have a strong preference for how the engine kill switch in that alarm worked. Namely, that the ignition was always disconnected whenever the alarm was armed. And as far as I know, it didn’t take extra current to do so. However since it did not specify what type of relay was used, and the circuit was internal, it is mere speculation. Regrettably, few alarms work that way. 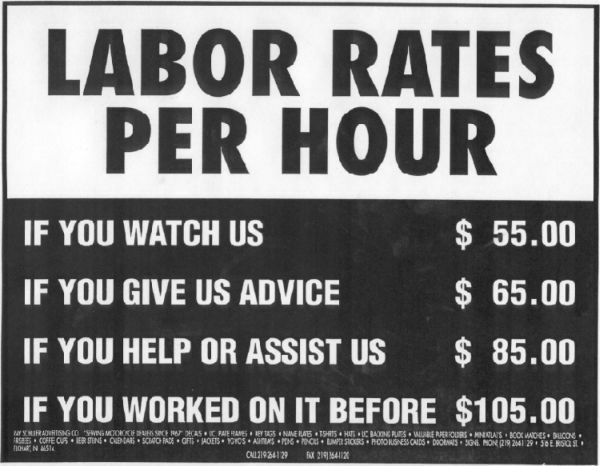 It would make the job a lot easier if they did. Here were gonna see the next best thing. How to make your own remote turn-off device with a reed relay. Though not perfect, it works just as reliably. And we’re going to do so using the ever-popular Coban GPS303G GPS tracker alarm. 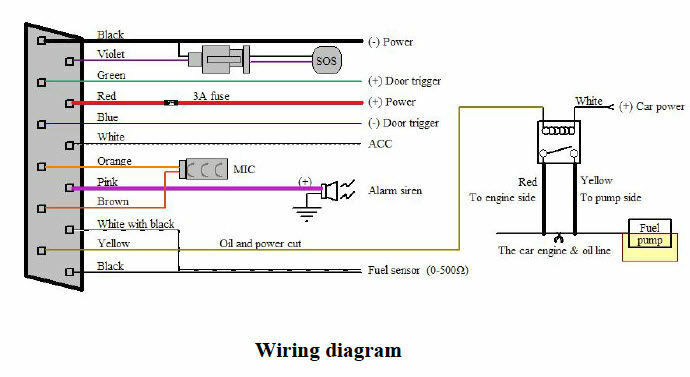 This is the wiring diagram for the Coban GPS303G GPS Tracker Alarm. For the Coban GPS303G used in this how-to, implementation is a bit more complicated. The “Oil and Power Cut” wire (remote engine shut-off wire) is simply a wire that is grounded when active. That is, it is supposed to serve as the negative connection of a separate relay. And it’s responsible of triggering the motor’s remote turn off. The issue with that is that automotive 12v relays draw around 160mA (0.160A). That’s a lot of continuous current draw for most tiny motorcycle batteries. Especially when running the GPS tracker simultaneously – another 10-120mA. The result is that you have very little time to actually use the GPS tracker to find your vehicle if stolen. At least if the vehicle battery is removed or disconnected, that is. And once the alarm’s battery is drained the relay deactivates and the engine could in theory be started. I wasn’t too happy with how that works on this GPS tracker, but oh well. It’s the best option available for the moment. While the “ideal” solution would have been to create some sort of exterior latching relay circuit, it would be bulky and impractical to use on a motorcycle. I went with a satisfying compromise – A Reed Relay. Reed Relays are very efficient, very reliable, and very long life versions of “normal” electromagnetic coil relays. They are actually very similar to regular relays. The wiring is essentially identical. But in exchange for the prior advantages, they tend to have a much smaller current carrying capacity. In this case that won’t be an issue, making it the perfect simple solution. 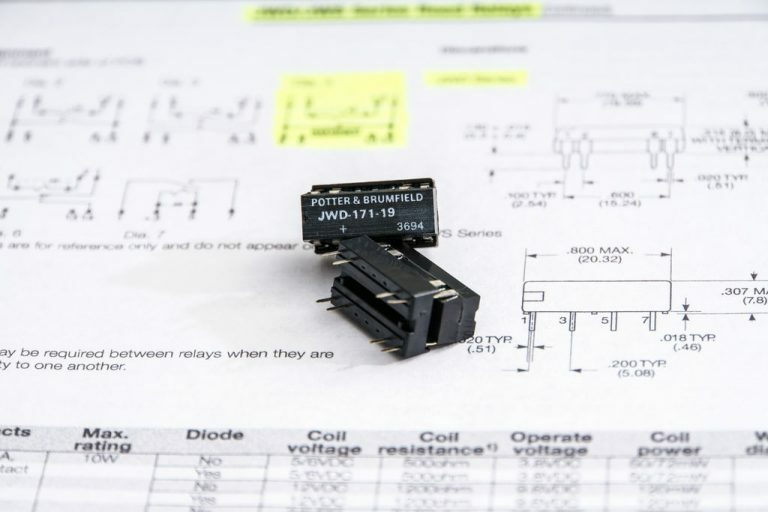 Checking the datasheet is always a good starting point. These little chips are the devices we’ll be using for the motorcycle’s kill switch. The type of relay required here is a NC, or Normally-Closed relay. Like the name suggests, the contacts are normally closed and when the GPS Alarm triggers the remote disconnect, the contacts open disabling the engine. 12v, but resilient to automotive voltage spikes. As much current-carrying capacity as possible. And as low-current consumption as possible. The best I could find was the JWD-171-19 Reed Relay from Tyco/Potter & Brumfield. In contrast to the 150-200mA of current consumption for normal automotive relays, this reed relay consumes only 10mA with its 1200 Ohm coil. They cost around 5 to 10$ per unit, and seemed perfectly suitable. The spec sheet can be found here. However, if you can’t find it, any similarly specced reed relay is probably just as suitable. I chose that model based on availability and price. If anyone knows of a more appropriate, cheaper model for a kill switch, post it below. Also, I’d imagine that doing this with transistors is also possible. Nonetheless, it wasn’t something I had enough experience to feel comfortable doing. Now one of the biggest questions remaining is what to wire the (reed) relay to? These are the options that came to mind when first thinking about the issue. Plus what I found and the conclusions I reached after further inspection. 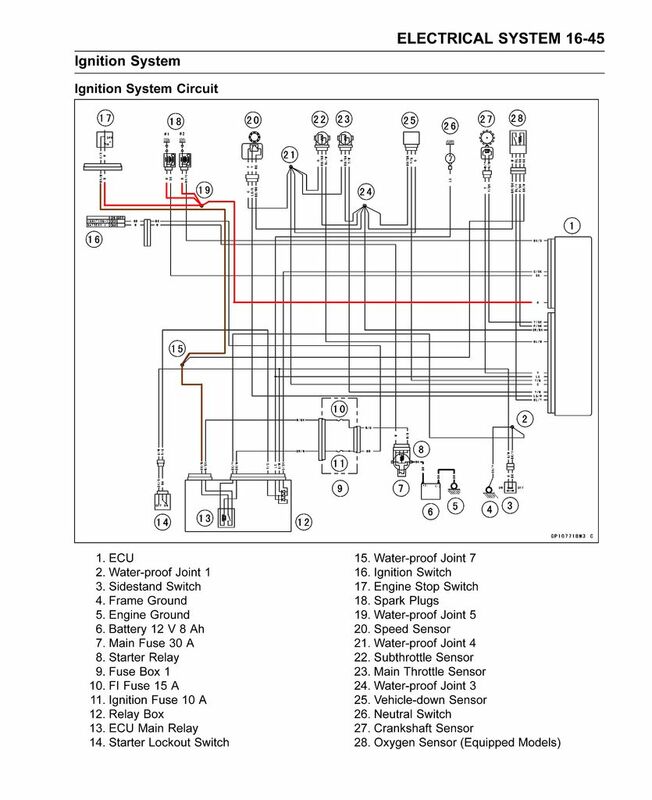 For didactic purposes from the 2013 Kawasaki Ninja 300 Shop Manual: Ignition System Circuit. There are plenty of circuits you can mess with to trigger a remote engine shut off with a GPS tracker. However there are quite a few differences between all of them. Before cutting any wires, consider the benefits and cons of each option. Here are the ones that I thought would be viable for a motorcycle. 2013 Kawasaki Ninja 300 Shop Manual: Ignition System Circuit – Ignition Fuse Wiring. This is the go-to option for most people. Just wire a relay inline with the ignition fuse wiring. I’ve done this method before, but I’m not all that fond of it. The thing is that the ignition wire has a 10 amp fuse. And at 12v, that isn’t an insignificant amperage. Given the importance of this wire (it directly feeds the spark plug coils), tampering with it effectively voids the warranty on the whole engine/bike. If the engine ever starts acting up, you’ll definitely be suspicious of your mod. If you take the bike to a mechanic with an engine running issue, they will blame it on that. Even if it’s totally unrelated – normally it is the weekend mechanic’s fault, after all. When I had issues with my Power Commander’s firmware (I didn’t know it was it’s firmware at the time), I was suspicious of the remote engine disconnect wiring. After all, Guardian Bells can only do so much when it comes to electrical gremlins. So while the Ignition Wire is an option, it isn’t really the ideal option. It’s high-current, and way too many circuits depend on it. The Ignition Wiring Diagram is attached above if you want to see how the ignition fuse is wired. 2013 Kawasaki Ninja 300 Shop Manual: Ignition System Circuit – Engine Stop Switch Wiring. When I was considering methods to kill the engine, I originally supposed that the kill switch on the handlebar would be sending a signal to the ECU to kill the engine. As opposed to actually forming part of the ignition system. I imagined it would be a lot simpler to tap into, compared to the ignition wire. I was wrong. The engine stop switch is inline with the Ignition Fuse, and as such has a 10 amp fuse (“carries up to 10 amps”). It also feeds the ignition coils directly. In case you’re wondering, I haven’t found an exact figure for how much current the ignition coils consume at 12v, but it’s around the 5 amps range each. Less than I suspected. In any case, wiring the remote engine shut-off to the engine stop switch is effectively identical to wiring it to the ignition fuse. It has all the same inconveniences and no benefits, ironically enough. The way it works is that if the ECU detects the bike has taken a spill, it kills the engine. Only momentarily, until you turn the engine off and on with the bike upright. If you could trick the bike into thinking it’s laying on its side perpetually, you could in theory keep the engine from running. However after studying the service manual, I found out this isn’t an “either 12v or 0v” sensor. The vehicle down sensor’s output works on 5v, which is less than I expected. It’s output varies between 3.55-4.45v when the bike is upright, and 0.65-1.35v when the bike is down. I would guess that substituting that output for ground may very will suffice to trick the bike into thinking it’s down. Or you could simply feed the correct voltage with a voltage divider. But regardless, I was beginning to realize that it wasn’t going to be the best option. Another issue I had with this method is that the ECU may very well store a counter of how many times the vehicle down sensor has been triggered. Or it might use the angle value for other type of metrics (ABS perhaps?). It’s mere speculation on my part, but regardless, messing with it proved to be an unnecessary hassle. There are better ways to pull off remotely shutting off the engine. 2013 Kawasaki Ninja 300 Shop Manual: Ignition System Circuit – Sidestand Switch Wiring. Finally, there’s the kickstand switch. This one sounds pretty promising. Given that the engine turns off whenever you put the kickstand down with the bike in gear, it seemed like a simple solution for an engine kill-switch. Plus, even if you introduce some resistance because your connections aren’t that great, you’re never going to be able to make the ECU read the wire as the other state. In other words, it won’t affect how the engine runs, nor give you problems. If your bike starts, the remote disconnect circuit is working. On the other hand, if it doesn’t at all, then you might have an issue. Plus, if you ever want to remove it all you have to do is install a new kickstand switch. The idea is to wire a relay inline with the sidestand switch. Its job is to allow the alarm to simulate the kickstand being down. If the bike is ever stolen, it’ll allow the thief to start the engine in neutral, but it will kill the engine as soon as he puts the bike in gear.If they put it into neutral again, it will start, but then it will die again once in gear. Imagine how incomprehensible that would be when you’re nervous and racing against the clock! I’d also like to think that by allowing the bike to run in neutral, you’ll at least get a few more minutes of battery life. If the bike can idle, the bike’s battery will gain some charge. That’s more battery life for the GPS tracker. Not much, but it certainly doesn’t hurt. So, that’s the theory. What about in practice? Well, after checking out the wiring diagram and doing some experiments, it all checks out. I ended up going with the sidestand switch for the remote engine disconnect. It was the best choice. It’s easy to wire and unlikely to give place to weird running issues. It was also the closest to where I installed the GPS Alarm, so I’d need the least amount of wire to hide. Another reason was that I thought how amusing it would be in the event that someone stole the bike. It cracks me up to imagine someone somehow hot-wiring it, but then looking in confusion at the fact that it turns off as soon as the bike goes into gear. That would be extremely weird from the perspective of any thief. If they reach the conclusion that the bike is defective and abandon the theft, mission accomplished. 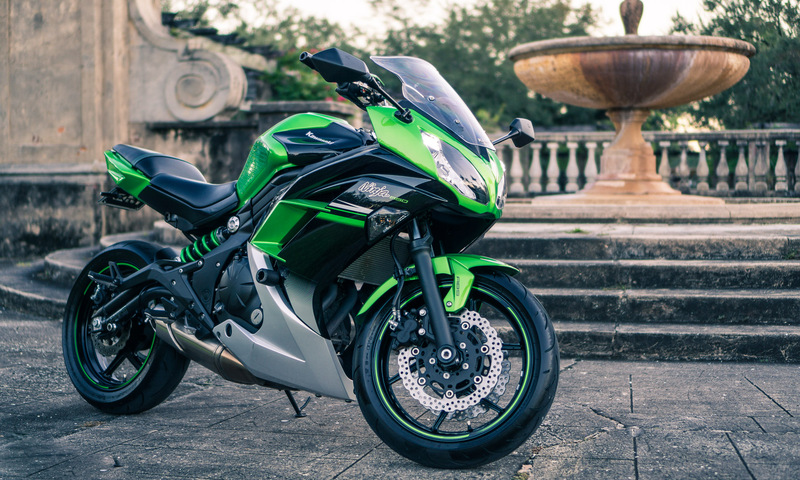 I wrote this tutorial with a 2015 Kawasaki Ninja 300 in mind. However, I was actually in the process of doing the install on a 2017 Kawasaki Ninja 650. For that bike, the shop/service manual wasn’t available yet. In other words, I had no electrical diagrams to check, so I initially supposed both worked the same way. Apparently I was wrong. Though the differences were small and didn’t change anything in practice. Comparing the shop manual for the 2013 Kawasaki Ninja 300 and the 2013 Kawasaki Ninja 650 – shop manual years, not vehicles – I noticed some differences. Despite presuming at first that the wiring would be identical for both models, it wasn’t. On the 2013 Kawasaki Ninja 300, the ECU is what triggers the fuel pump relay. On the other hand, for the 2013 Kawasaki Ninja 650, the Ignition fuse/Engine Stop Switch is what triggers it. This means that you should always consult the shop manual of your specific motorcycle prior to making any assumptions. The circuit might be different even for similar models from the same brand. Whether it’s a difference that matters or not is a coin-toss, but it’s a good idea to check anyway. Anyway, I just wanted to add that disclaimer. More than a problem, this is just a curiosity for moto-nerds. It just means that “behind the scenes”, something might be powered by a different circuit or fused somewhere else. That’s another reason to choose the kickstand switch. Its circuit is unlikely to differ In the context of the remote engine shut-off. The kickstand will almost invariably be either 12v or 0v for any bike depending on if it’s up or down. Here I’ll go over how to turn a reed relay into an packaged component you can wire your GPS tracker or alarm to, to shut the engine off remotely. This is the wiring diagram we will be using for the remote turn off. You might wanna notice all the unused pins you can remove from the IC Socket if you’d like. First of all, gather together the components you’ll need for the kill switch. For the complete list of what I used, checkout the parts list in the main post. There I go over every component, tool and supply used in detail. Both for protecting the IC from the heat of the soldering process, and to make replacing the chip possible in the future if need be, I decided to use an IC socket. I also removed all the terminals I wouldn’t be needing. Here you can see the removed terminals better. The first step is to prep the 16 Pin IC Socket. Looking at the pinout of the reed relay, you’ll notice that it only uses a few pins. Since they aren’t necessary, consider removing the extra pins. Namely, 3, 4, 5, 9, 10, 11, 12 and 13 in this case. Whether you want to bridge 7/8 and 1/14, or remove one of each pair, will depend on your soldering skills. It’s probably better to bridge them (for current reasons, albeit minimally), but by no means necessary. Using pliers, push the unnecessary pins out from underneath. Or simply trim them with flush cutting pliers. Nonetheless, to reduce the chance of short-circuits after soldering, it’s a good idea to remove them. Once you’ve made sure which wire goes where on the kill switch relay, solder the connections. Solder the connections, making sure you pick the right pins. The little dent on the IC Socket is next to pin 1, so wire it accordingly. Remember to remove the relay before soldering to protect it from the heat. I connected the Red wire (+12v) to pin 2, the Black wire (Alarm output) to Pin 6, and Blue wires to Pins 8 and 14. Also, remember that this alarm triggers the ground for the relay, not the +12v! After soldering, check each pin against each other pin for short circuits using the continuity mode on your multimeter. There should be infinite resistance between all pins. 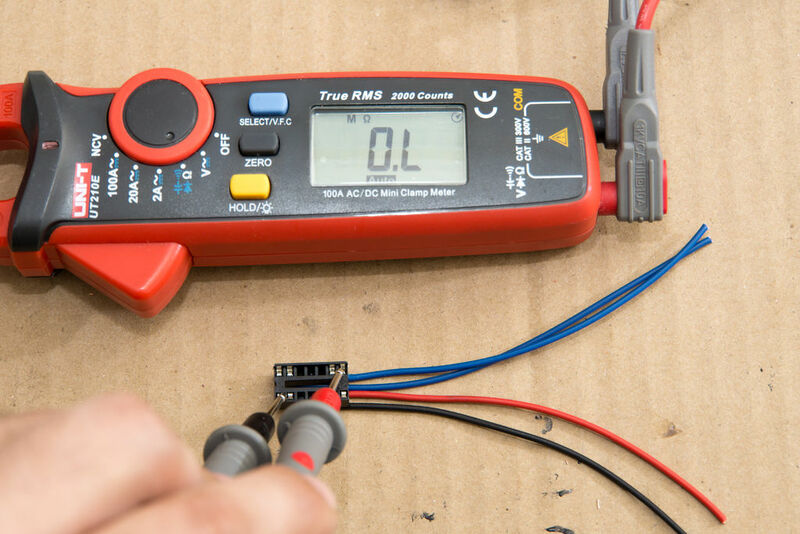 Check the terminals with the Continuity mode of your multimeter to make sure you don’t have any short circuits between the terminals. Check each terminal against each other terminal. Once you have wired up the relay, but before you have sealed it up, it’s a good idea to test the setup. Simply rig up a little test circuit on one of these cute little breadboards along with a 12v LED (T10 LEDs for car interiors are great for this). For power, I highly recommend one of those cheap adjustable tattoo power supplies. The black wire goes to ground. Applying or removing 12v to the red wire is how you trigger the relay. The blue wires are simply the input and output of the “switch”. Also, this is purposely a Normally Closed (NC) relay, so the LED should shine when the relay is not active (button not pressed), and turn off when the relay is powered. Though here I wired the switch on the 12v side, keep in mind that the GPS tracker I installed this with has the switch on the ground wire. I’d personally recommend epoxying the connections to protect them from short circuits or breaking loose from the vibrations. It’s cheap insurance. If you do encapsulate the connections, make sure too much epoxy doesn’t leak through the rectangle gap in the middle. Ideally you want the epoxy to be more or less flush with the base as seen in this image. I made a spare, just in case I have to do another install or the odd case where the relay fails. To protect the unit and it’s terminals from corrosion, I decided to heatshrink the chips using marine heatshrink. It leaves a very good-looking result. If you don’t intend to add quick connector, then you’re all set. If you do…to the next picture! Once you’ve made sure the unit works properly, encapsulate the connections to protect against vibrations and short circuits. I just used a dab of liquid electrical tape on any bare metal, and then some epoxy to encapsulate it. To make the epoxy black, I used a drop of epoxy pigment. To give the epoxy more volume, I used some epoxy filler – basically just micro glass balloons. It also works great to make it thicker and more paste-like, so it wouldn’t drip everywhere. Quick tip – Epoxy is always a pain to use since it requires preparation beforehand and cleanup afterwards. Using disposable mixing cups and makeup spatulas just makes life easier. They cost next to nothing considering that a unit of each will last most people a decade. Plus, the measurements on the mixing cups make it a lot easier to get the proportions right. Ever since I’ve started using them, I shun the idea of mixing epoxy on cardboard like I used to. Once the epoxy is dry, use some adhesive heatshrink to seal the chip in. For heatshrink this large I’d definitely recommend a heat gun. A lighter just isn’t going to do a nice job without burning the tube. Finally, while the stuff is still hot, crimp the ends with some pliers. I like using quick release connectors whenever possible. It looks a lot more professional and makes diagnosis much easier. They cost next to nothing so if you have the time to wait for a 10 pack to come from China for less than 1.99$ shipped, place that order now. Now this is the final product! Remember, you only need one. I just made a spare in case. Just for my own future reference, this is how I wired the connector, as in which wire went to which terminal. I like it when manufacturers make components serviceable and replaceable. So when I do any automotive work, I try to return the favor. Thanks to the wonderful, wonderful world that Ebay is, you can get bulk packs of most electrical connectors for just a few dollars. I always try keeping a few on hand in the most typical sizes. Specially considering that prices are cheap, but shipping does take a few weeks. In this case I used a 4 way electrical connector. You can check the images to see what pinout I used, and how I wired it. To install the quick-connector you’ll need a wire stripper and some decent terminal crimpers with the right jaws. You might want to add some solder to the connections after crimping since you already have your soldering gear out. However, keep in mind that soldering on vehicle wiring can create issues, compared to crimping. You should always consider whether it is best to crimp or solder. I wrote a pretty interesting article on that topic. An added advantage of using a connector is that it makes troubleshooting and diagnostics a lot easier. If you ever want to remove the relay, you can make yourself a bypass plug and simply substitute the relay. And you’re done! Now you’ve put together a remote engine shut-off device. Good job! The next step is to hook it up to your GPS tracker or alarm. To see how I did it, continue reading the GPS tracker alarm install DIY. So, what do you think? Did you learn enough to see this as a job you could pull off? Or does it now look so complicated that you’d rather not even try? Let’s not kid ourselves, installing a remote engine shut-off device on a motorcycle isn’t exactly easy. But it isn’t impossible, either. Consider giving it a try. Worse case scenario you can always leave it like it was before. Great and technically solid article! I really like this serie, and I’m following it to install it on my brand new Kawasaki Ninja 650 2017, but I have an issue following you in the idea of connecting the relay in the side stand switch. In the Ninja 650, where is it, or where can I find it? How do I know where to plug this relay? BTW, your DYI’s are amazing I have learned to much already, thank you. I installed it on a 2017 Kawasaki Ninja 650 too. The plug is the two wires that comes out of the little black switch on the kickstand itself. If I recall right, the connector itself is behind the black plastic front sprocket cover with a few other wires. Good luck with the install and congrats on the bike!